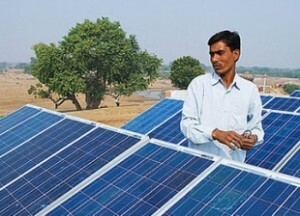 India’s solar developers have been looking very smart in the last couple of years as they kept on making money by bidding increasingly lower prices for solar power projects. The rapidly falling solar panel prices allowed them to keep bidding lower prices as the fall in costs more than compensated them from falling tariffs. Financial models were built on 15-20% falling solar panel prices which any prudent person would tell you is quite dumb. The trend of solar prices has been down 10% since 1955 and that too leveled over long time periods. Expecting solar panel prices which have fallen by 20% to fall another 20% is quite foolish. However, these developers kept on making these foolish decisions and now they finally find themselves in a big bind. Not only have solar panel prices increased to 37-38 cents/watt due to heightened Chinese and USA demand but there is quite a high probability of the Indian government imposing anti-dumping duties on imports of Chinese solar panels which account for almost 90% of the Indian market. These developers are now crying wolf saying that this is unfair. What will be unfair is Indian consumers paying for the foolish decisions made by these developers. No one had compelled the Indian solar developers to bid such low prices just to win capacities and develop a large pipeline to sell to other investors. Not that their risky bets are going awry, developers are almost every day putting on media headlines to say that this is not good for the Indian solar industry. What is not good for the Indian solar industry to have these developers and fly by night operators playing in the industry. When one or two fail they bring a bad name to the whole industry. These developers may still be saved as people expect that the high prices of solar panels should come down in the coming months as the USA decision of Section 201 will be released. This will lower the inventory building that was happening and lower the pressure on supply. The lowest solar tariffs of ?2.97 and ?2.44 per unit, arrived at earlier this year in the Rewa Ultra Mega Solar Park and Bhadla Phase III solar park auctions, respectively, were based on assumptions that solar module prices will drop by another 10-15 per cent to $0.26-$0.28 a watt. Acme Solar , a subsidiary of ACME Cleantech, emerged as the lowest bidder in the Rewa and Bhadla auctions. Other winners of these auctions, including SBG Cleantech, Mahindra Renewables and Solenergy Power, did not respond to queries from BusinessLine. Industry players fear the real risks for recently bid projects come not from the global factors, but from India’s domestic policies. The possibility of anti-dumping duty on imported solar cells is worrying developers as it will increase the price of imported solar modules to around $0.40 (even after they fall to the previous levels) while locally-made modules are unlikely to become cheaper than the current prices of imported modules.